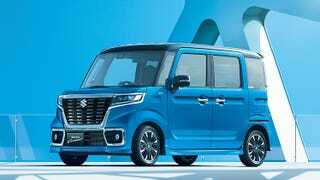 Suzuki’s been making kei cars with hybrid systems for a few years now (I believe they’re the only manufacturer that’s ever sold hybrid keis, although Daihatsu’s shown concepts), and 15 years ago made the first hybrid kei car, the Twin Hybrid. As far as I can tell, all of Suzuki’s kei car hybrid systems have been classified as mild hybrids - as I discussed in part 1 of my primer on hybrids, this means that the engine must be running to provide propulsion. The Twin used a sandwich hybrid attached to the engine (sometimes also called a P1 hybrid), which would be a form of mild configuration. Far more recently, Suzuki decided to attempt to sell hybrid kei cars again - their eNe-CHARGE idle stop/regenerative alternator system (which some manufacturers would have called a micro hybrid, but to their credit, Suzuki didn’t) proved successful, so they extended it into the S-ENE CHARGE mild hybrid system, using a belt starter/generator (sometimes also called a P0 hybrid) producing 1.6 kW, or 2.1 hp at what’s essentially idle. Not much, but that can help a kei a lot with low-end torque, keeping engine RPMs down, and keeping things more efficient. For 2017, though, they updated the S-ENE CHARGE system, increasing battery capacity and motor power. The motor now produces 2.3 kW, or 3.1 hp at essentially idle... but they added the ability for creeping without engine power. Note that it’s still a belt starter/generator system, and Suzuki calls it a mild hybrid still. All I can figure is that they decided it was worth spinning the engine without fuel delivery for creep mode, but that’s just weird.